Why do we use Mentorloop? For Mentees & Mentors: Mentorloop helps to provide timely bite-size pieces of advice and content to help mentees engage their mentor and to help mentors structure their meetings with mentees. This proactive content has been based-off feedback from real IMNIS mentees on what they found most helpful for building a mentoring relationship with their mentor. For IMNIS: IMNIS use Mentorloop to register new participants each year – through this process they’re able to learn about the preferences, goals and biographies of both mentors and mentees. Using this data, IMNIS are then able to use Mentorloop’s Matching algorithm, in combination with IMNIS’ significant experience matching mentees with mentors, to make the best matches possible. In addition, Mentorloop provides a centralised communication portal to help IMNIS engage the hundreds of mentees and mentors who participate from the diverse range of universities and business across Australia. To be a part of IMNIS you would have already achieved significant success in your academic or professional life. For many people, this success has, in part, come about thanks to the help of a great teacher, an encouraging family member or an inspirational co-worker. Yet for every successful connection, there are countless examples where people development and mentoring fall by the wayside over time. IMNIS and Mentorloop can’t replace years of professional experience or the power of a single great conversation, however, it can facilitate the development of a successful mentoring relationship through a light-touch structured approach. This way IMNIS can ensure a benchmark of outcomes and experience for all mentees. 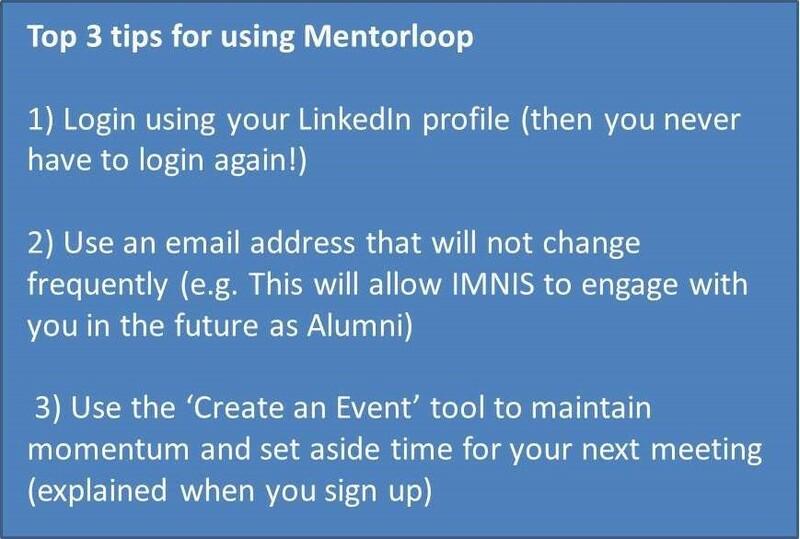 Mentorloop was used during the IMNIS pilot programs. While much of the feedback was positive, Mentorloop valued and embraced constructive feedback and have made significant changes since the original pilot. Action: Working with IMNIS, Mentorloop has added a light-touch user journey to support mentees and mentors in the days, weeks and months after the match is made. In addition, Mentorloop now has full email integration, which means messages sent to, and by, mentees/mentors can be read in full in their mentor’s/mentee’s inbox, and participants can simply reply to the notification to have their engagement stored in their ‘Loop’. The Mentorloop platform is important for IMNIS to ideally match participants and track the success of partnerships. Communication between mentors and mentees is private; however, the volume and time of interactions are recorded to best assess the high-level health and activity of the program year-on-year. You don’t need to use every aspect Mentorloop but registration and participation are required for IMNIS to include you. Additionally, your mentor or mentee may find certain aspects of the service incredibly useful, even if you do not (e.g. To save summaries of goals and outcomes for reference prior to meetings). Australia is ranked lowest among OECD nations in collaboration between business-research collaborations – not just large businesses, but also small to medium enterprises (SMEs) – so it’s critical to our economy that we get this program right. Several mini-tutorials covering Mentorloop tasks, tips and tricks are available here. If you have any questions not covered above, please reach out to either your IMNIS Program Coordinator or Mentorloop directly.